The Kanger TOPBOX Mini Starter Kit is a great way to experience Temperature Controlled Sub-Ohm vaping with up to 75 watts of power, whether you prefer to wrap your own coils or simply purchase pre-built coils for convenience. 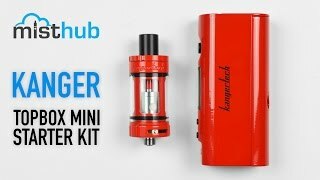 The Kanger TOPBOX Mini Starter Kit includes the popular KBOX Mini TC-75 and TOPTANK Mini (4.0ml) to create the ultimate combination of form and function in a single starter kit. The TOPTANK Mini holds 4ml of your favorite e-juice and features a new top "fill design" that makes it much easier to fill your tank without requiring it to be disassembled or drained. Simply unscrew the top part of the TOPTANK Mini and fill through the slot until the tank is full, then replace the top cap and hand tighten. Note: The TOPTANK can also be filled from the bottom as well. The Kanger TOPBOX Mini Starter Kit includes two Stainless Steel Organic Cotton Coils (Ni200 0.15 ohms) and a (SSOCC 0.5 ohms). Kanger also offers Atomizer Heads with higher resistances for those who prefer "mouth to lung" inhales (1.2 ohms & 1.5 ohms) that are sold separately. The KBOX Mini TC-75 is powered by a single replaceable 18650 battery (not included) and supports Nickel, Titanium, Stainless Steel, and Nichrome coils in Temperature Control Mode along with Kanthal coils in VW Mode. The KBOX Mini TC-75 can fire atomizers down to 0.1 ohms with a rated output from 7 - 70 watts and features Micro USB Charging, Spring Loaded 510 Connector, OLED Display, and Short Circuit Protection. The KBOX Mini TC-75 is constructed out of High Grade Stainless Steel and is built to last "day to day" use while providing great vapor production and flavor. Kangertech’s TOPBOX Mini Starter Kit has long been the go-to option for countless smokers that are looking to end their nasty habit for the long haul, providing an effective and straight-forward solution for anyone that’s interested in vaping. Opening up the box, you’ll immediately be greeted with the KBOX Mini and the Top Tank Mini. Kanger also provides several accessories to increase the functionality of this kit, including the Top Box Mini Instruction Guide, Kanger Authenticity Code, Micro USB Charge cable, extra cot-ton, spare o-rings and screws, 0.5 ohm Clapton coil head, mini RBA Plus head and a 0.5 ohm Stainless Steel coil head. The KBOX Mini is a 75W TC device that’s constructed out of 304 stainless steel. On top of the device, you’ll see a stainless threaded 510 connection that features a spring loaded contact pin, and machine cut divots for extra airflow on those older atomizers. On the front of the device is the fire button, OLED screen display, two regulatory buttons and the microUSB charge port. On the back, we’ve got a Kangertech logo that serves as a battery venting hole, and a mag-netic battery door that houses a single 18650 battery. After inserting a battery, the device powers on. With the device powered on, the bright OLED screen clearly displays the current battery power, resistance, voltage and wattage. The two regulatory buttons will increase or decrease your current wattage. The KBOX Mini features a maximum output wattage of 75W and is fully functional in temperature control mode with both Titanium and Nickel coils. When not using the KBOX Mini, five clicks of the fire button will power the device off and make it travel-ready. The Top Tank Mini is a powerful sub-ohm tank that features a 4mL fill capacity and is con-structed out of Stainless Steel and Pyrex glass, standing at 45 mm tall and 22 mm wide. On top of the tank is an interchangeable, heat-resistant 510 delrin drip-tip, and Kangertech ma-chine cut little grooves into the top-cap for a little extra grip when removing the top cap. With the top-cap removed, you can see down into the chimney, and the two, large, top-fill fill-ports for fast and painless filling. The bottom of the top-cap is equipped with a rubber gasket, ensur-ing a nice vacuum seal when then tank is properly re-assembled. The base of the tank fea-tures a fixed, dual-adjustable airflow and a threaded 510 connection. With a few simple twists, the Top Tank Mini disassembles, revealing a powerful 0.15 ohm kanthal coil head that fea-tures 3 large wicking ports and is wicked with Pure Organic cotton. This pre-installed coil head is rated for best use between 15-50 watts. Overall, the TopBox & TopTank Mini combination provide an intuitive vaping system that’s pretty straightforward and gets right to the point. This small, reliable kit has lead to countless success stories from ex-smokers that wanted to quit smoking for the long haul, myself includ-ed. If you’re looking for the perfect setup to stop smoking and get into vaping, or just want a compact device that feels good in the hand, the powerful TopBox Mini kit can handle it all, and then some. Thanks for watching!